John Kotter’s study of 100 companies found that only 30% of change initiatives fully succeed. Twelve years later, despite a profusion of “change management” programs, McKinsey found essentially the same results after surveying over 3,000 executives. Even when important projects do not fail completely, as is frequently the case with technology implementations, many of them underperform, take twice as long as planned, and cost 2-3 times as much as originally estimated. Why is that, and what can be done to overcome those odds? There are many reasons, but the root of the problem can be illustrated with this simple example of an iceberg. A common mistake is to focus primarily on the outer, visible game (Level 1) at the expense of equally important, hidden levels below the surface (Levels 2 & 3). Listed below are additional descriptions of each of the levels, but without fully addressing these hidden, inner-game levels you are sacrificing 2/3 of the potential success factors. We offer insights, tools and strategies to enable leaders in start-ups and mature organizations to fully access all three levels, for themselves, for their teams, and for their organizations. Please review our Services and Typical Client Results pages for additional details of how we accomplish this. Typical Level 1 approaches involve “change management” as a complement to project management, use of checklists, and focusing primarily on communication and training. The problem with relying primarily on this approach is that change can and does bring up many emotions for people, including fear, anger, and other frequently irrational concerns. Even though many of the checklist-based change management programs talk about addressing resistance, they typically do not go deep enough to get the job done. Typical Level 2 approaches discuss utilizing EQ, or Emotional Intelligence. While EQ is often defined as the ability to identify and manage your own emotions and the emotions of others, it typically relates to individuals and does not fully translate to leading change in teams and organizations. A fully developed approach to Level 2 involves tapping into positive passions and emotions of organization and team members, as well as addressing and potentially assuaging their more fear-based, shadow side. Level 3 is usually not even considered when leading change, and may be the most important element. Level 3 most closely relates to culture, which is the invisible, collective way that teams and organizations get things done. 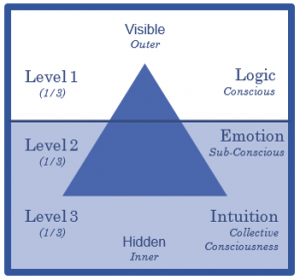 Fully leveraging Level 3 involves tapping into the larger, collective consciousness of the larger society and eco-system in order to “see around corners” for the next big thing or disruptive competitor. We have over 25 years experience with tools and methodologies to access Level 3. For more information or to begin a conversation to see how we might get these results for your organization, see our Services page, email a request to rm@richardmarks.com or call (+1) 650.302.3500.